There aren't too many marquees that can boast as long a heritage line as the mighty Jeep – from a 1941 Willies military Jeep to the latest, greatest Grand Cherokee’s and Wrangler’s, this years sun-drenched Jamboree had the lot all on display at the Morisset campgrounds just a short drive north of Sydney. With the shifting dunes of Stockton Beach and the tough terrain of the Watagan Mountains all with easy drive from camp, there were indeed plenty of great drives for entrants to choose from. It was a brilliant sight to have some of the original old banger 4WD ‘horseless carts’ driving side by side with all the electronic wizardry that is a 4WD of the new millennium – Willies V’s Wrangler, CJ V’s Cherokee, stokers V’s crazy customised numbers – that’s just shy of seven decades of motoring history to perve on. If the actual vehicles weren’t enough to get passers-by sucked into the scene, then surely the ever-enthusiastic owners and families of said Jeeps exemplified just how much fun it can be to belong to such a famous family tree. To all Jeepers credit, having a get-together every second year for what may well be one of the oldest marquees of 4WD on the planet, is an awe inspiring event. Having spent two days amongst the enthusiasm, the pride and the camaraderie of the 2008 National Jeep Jamboree (which attracted 230 Jeeps), I’d even contemplate buying a Jeep just to go to the next gathering. If you missed this years gathering of all things Jeep, you’ve got two years ‘till the 2010 event in Victoria to brush up on your Jeep knowledge, stock up on your Jeep clothing, perhaps get yourself a Jeep tattoo and of course get your very own example of one of the worlds most recognisable brands of 4WD. To all 4WDers, lovers of Jeep or not, do try and make an effort to have a gander at the next Jeep Jamboree – you’ll become thoroughly immersed in the history and the future of 4WDing. Yep, there was plenty of ‘show’ on offer, but these Jamboree’s are just as much about driving, getting dirty and having fun in a 4WD. The Watagans offered everything from easy C-grade dirt road jaunts to ridiculously hard, vehicle pounding A-grade tracks that were only achievable for those with lockers, oversized rubber, winches and that demented look in ones eye that is required to drive the seemingly impossible. Sand lovers were well taken care of with multiple trips for all grades to the massive dunes of Stockton Beach. Events like The Ramp, Gymkhana, Blind Fold drive, Slow Crawl and the Water Bucket Cruise kept the determined and non-serious alike well amused back at the show grounds. 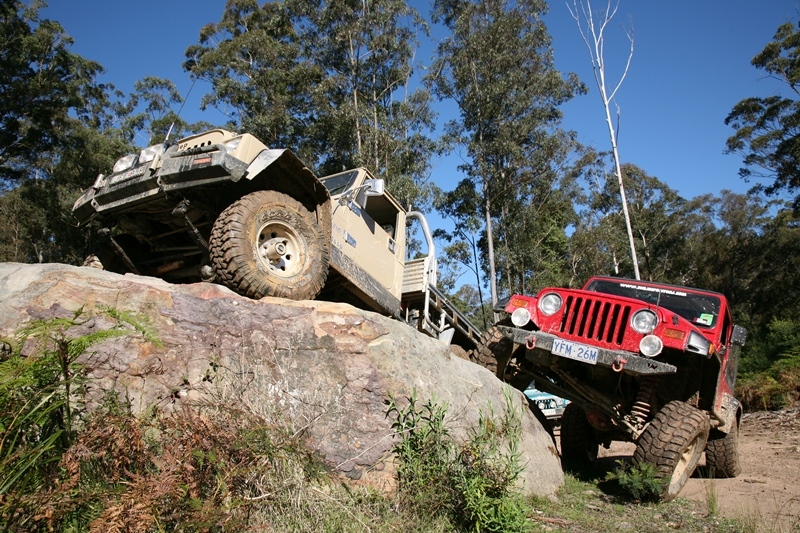 There aren't too many vehicle manufacturers that really get behind the sport of 4WDing as much as Jeep Australia. Not only do they contribute to the organising committee to help make the whole show happen, but their personnel turn up in droves to be part of the fun and action. Now, it’s not just the workers that turn up ‘cause they’re told to, no, the big knobs right up to managers, CEO’s past and present, get down and dirty amongst all the fun and hard work. As an example of their generosity and willingness to help out the brand in general, Robert Moorcroft (one of the aforementioned big wigs) outbid all and sundry the right to win a mountain bike in the Sunday night auctions. To everyone’s surprise and delight, he threw the bike back into the ring for a re-auction – and paid his wining bid as well to effectively double the money raised. All money raised on the night was donated to charity – good on ya’ Rob and top marks Jeep Australia. It’s the hard yards behind the scenes that make any event happen. This years’ successful event was through the hands of the small Cherokee Club of Australia, which is based in the NSW Central Coast and had just seven months to prepare instead of the usual two years for a Jamboree. Good stuff people and congratulations on a top event. What a great night the presentation dinner was with a Cowboys and Indians theme – Jeep owners wielding bows ‘n’ arrows makes for a wild night for sure!